2017 - !! Welcome to Sudarshana Sena !! The pure Indian breed desi cow produces A2 milk, which contains less Betacosmophorine-7 (BCM-7), Thus A2 milk is the healthier option. Attributes of desi cow milk: Calcium found in desi cow milk protects the colon cells from chemicals which lead to cancer. 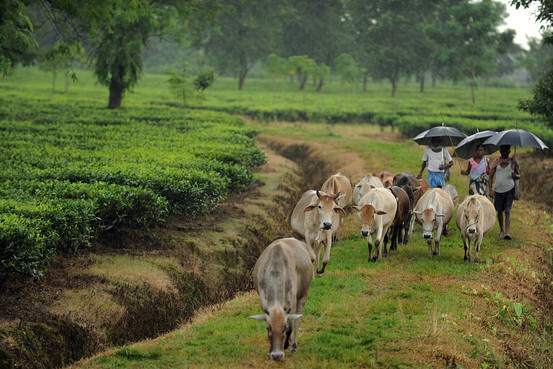 Desi Cow gives us the entire requirement of our farming activities in Agriculture. It helps us in transportation of our goods. It works in our agricultural lands. Thus the food we consume is because of the help of this mother cow. It gives us the medicine for our health. It saves the crop from pest, insect and fungi. Finally it becomes a part of our family. For giving all the above; what we are giving. We are giving all the unwanted items for humans such as grass, stray etc, after taking the oil from cotton seeds, ground nuts, coconut and the remaining thing is given to the cow. In case this is not required for cow, for human being it is a waste and in fact we have to spend money to dispose this. 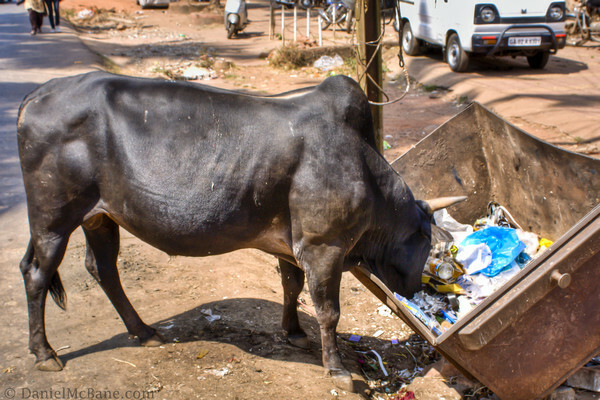 Thus an environment recycle is done with the help of cow. The National Bureau of Animal Genetic Research has recently demonstrated the superior milk quality of Indian cattle breeds. After scanning 22 cattle breeds, scientists concluded that in five high milk-yielding native breeds – Red Sindhi, Sahiwal, Tharparkar, Rathi andGir – the status of A2 allele of the beta casein gene was 100 per cent. In other Indian breeds it was around 94 per cent, compared to only 60 per cent in exotic breeds like Jersey and HF. The A2 allele is responsible for making available more Omega-6 fatty acids in milk. 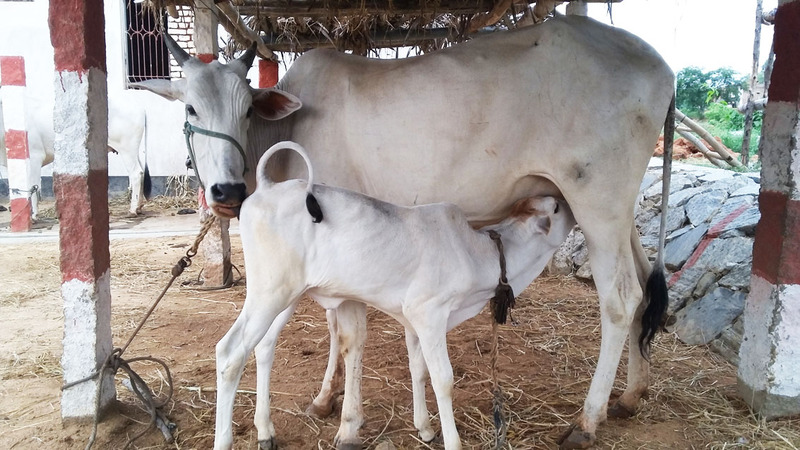 The pure Indian breed desi cow produces A2 milk, which contains less Betacosmophorine-7 (BCM-7), as opposed to the hybrid cows which generally produce A1 milk. Magnesium -> for muscle function and elements Vanadium, chromium, tin, aluminum, abhrak and sisa. Charaka Samhita, the ancient text on Indian Medicine, strongly recommends the use of Desi Cow products for the treatment of various ailments. We produce organic fertilizers, pesticides, fungicides, insecticides from Desi Cow’s dung and urine for our agriculture requirement. The fertilizers from Desi Cow’s bi-products will have all the essential requirement of the Agriculture and the crop. The Fertilizer is called as Panchagavya and the Pesticides / Insecticides / Fungicides is called as Agnihastra. Please contact us for your organic fertilizers and organic pesticides / insecticides / fungicides requirement. Urine Therapy provides an Ayurveda, natural alternative care for most of the diseases. Through consistent research and development we have been able to provide natural alternative herbal solutions based on 5000 year old natural ayurveda science to take care of patient. Scientists at the Junagadh Agricultural University (JAU), who analysed of urine samples of 400 Gir cows, found traces of gold ranging from three mg to 10 mg from one litre urine, The Times of India reported today. The precious metal was reportedly found in ionic form, which is gold salts soluble in water. 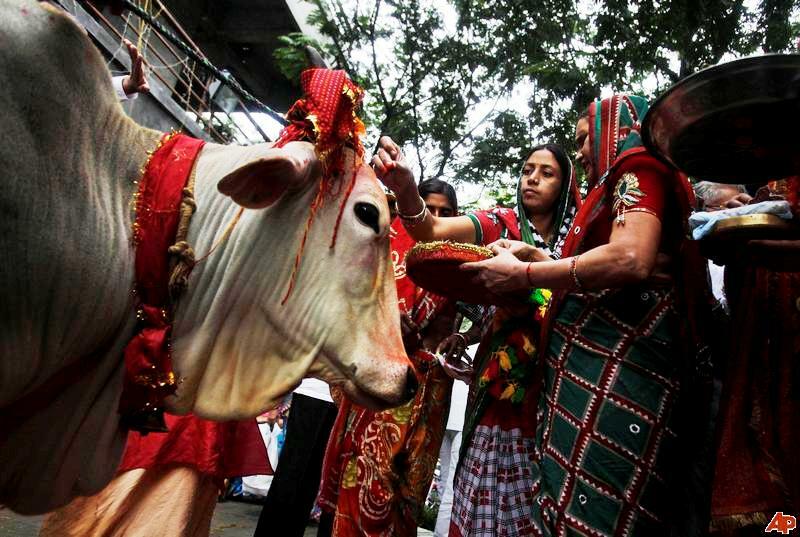 In what could come as a huge boost to the activists campaigning against the slaughter of cows, scientists at Gujarat's Junagadh Agricultural University (JAU) claim to have discovered gold in cow urine. 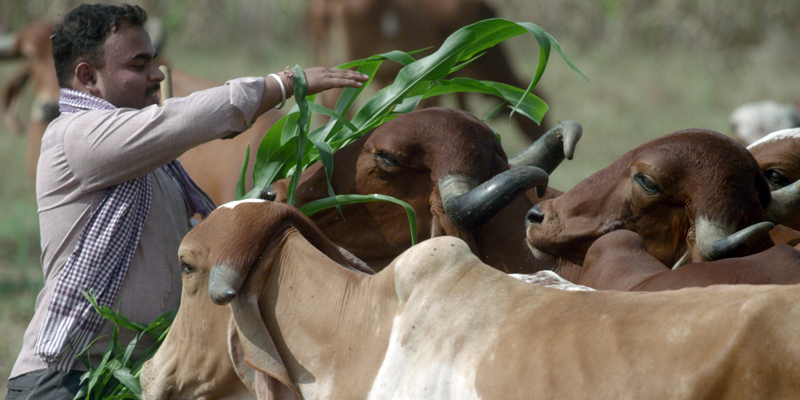 For now, they claim that the precious metal is found only in the Gir cows that are native to the state. A team led by Dr BA Golakia, the head of JAU's biotechnology department, have been carrying out the landmark study for the last four years before they were able to confirm the remarkable finding. As part of the research, urine samples of 400 Gir cows were tested at the Food Testing Laboratory of the JAU. "We started the research almost four years back and tested cows from different age groups including pregnant cows, calfs, aged cows and the milking ones. 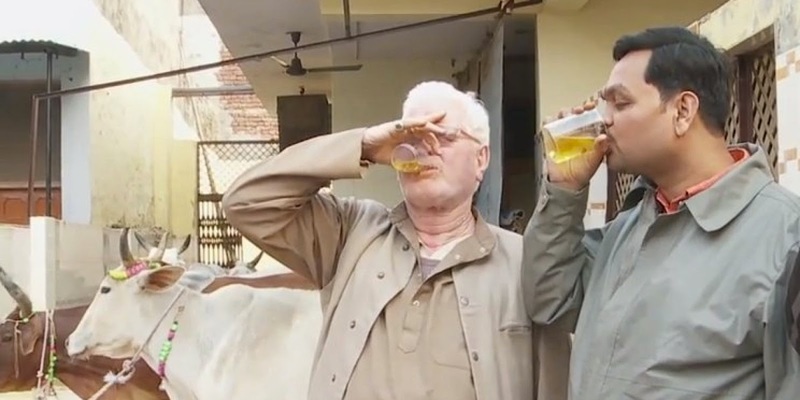 The amount of gold presence varied in all of them -- from 3 milligram to 10 milligram per one litre of urine to be exact," Dr Golakia told ScoopWhoop in a telephonic interview. 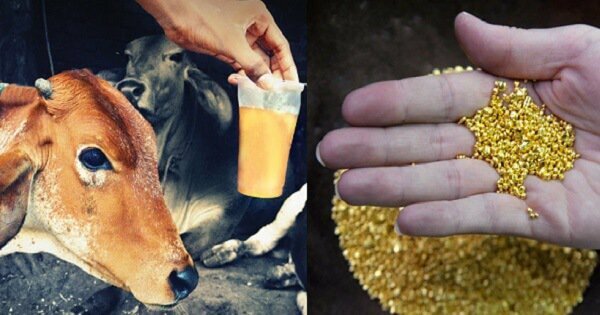 So what will be the approximate value of gold extracted from cow urine? According to Dr Golakia, the value of the gold extracted from 1 litre of cow urine would be around Rs 30. But the procedure to extract gold is around Rs 10, so the net worth of gold extracted would be around Rs 20, Golakia said. The gold from the urine can be extracted and solidified using chemical processes that would require a laboratory. However, the researchers have not been able to explain why traces of gold are being found in cow urine. 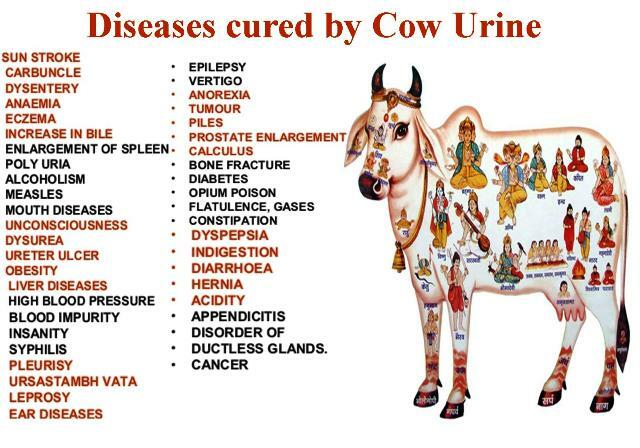 Today many AIDS patients are taking cow urine therapy. People who were suffering with migraine and headache for the past 15 years have recovered within six months of taking this therapy. Whether it is the question of relieving tension or improving the memory power. 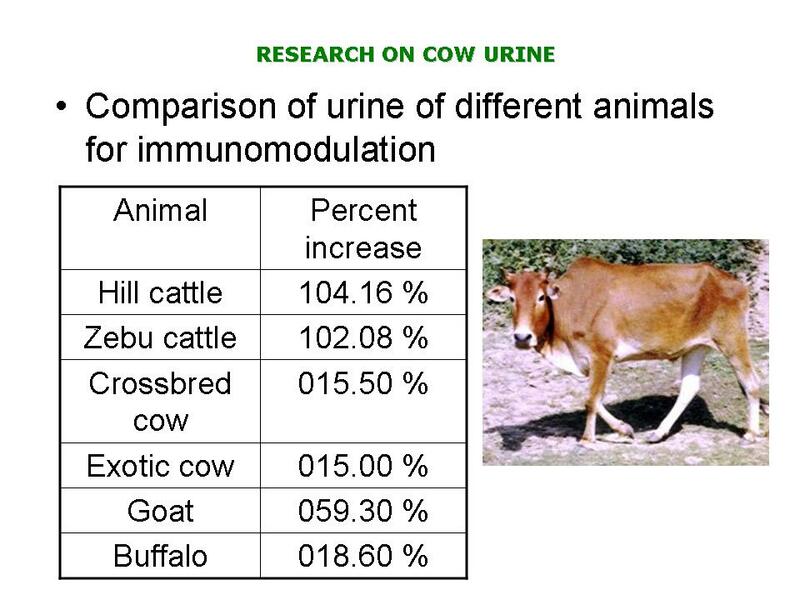 In the past few years the Cow Urine Treatment and Research Center, Indore has treated one and half lakhs of people. Out of the total patients 85 to 90 percent were patients of constipation there is an old saying that if the stomach is clean half of the diseases get cured automatically. It was in the days when Sri Matha functioned with Kumbhakonam as its headquarters. There was a large cattle-shed behind the Matha. One day, a cow that did now belong to Sri Matha was found in the shed feeding on the hay and drinking at the water-trough. It was not known whose cow it was. The news was passed around in the neighborliness, but no one came to claim it. Four or five days passed. The Manger asked Periyaval, "Shall we drive away the cow?" "If the cow must be driven out because it does not belong to Sri Matha, then several people in our Matha should also be sent out". There were indeed many people living in the Matha, eating and sleeping there, doing no particular work. "The cow cannot speak for itself. We do not know its master. Let it stay on in our cattle-shed. It is our duty to protect it". As the days passed it was seen that the cow was getting ready to calve and in due course did so. The Manager came back to Periva. "The yellowish milk yielded after calving has stopped. The cow seems to be of a very good breed. It is nourished on good cattle-feed too. It gives four large measures of milk in the morning and in the evening". "Hand over all the milk to Kalathisvara temple for abhiseka. The cow does not belong to Sri Matha. So the milk must not be utilised by the Sri Matha". Two days passed. Periyaval questioned the Manager. "What are you doing with that milk?" The Manager replied hurriedly, "I have made arrangements for the milk to be handed over to the Kalathisvara temple everyday". "All the same, it is likely that the milk may be used in Sri Matha, by mistake. So, handover the cow and calf to a Siva temple". The Manger did as instructed. But the temple had several cows already and found it difficult to take on one more. The temple trustee announced the auction of the cows. 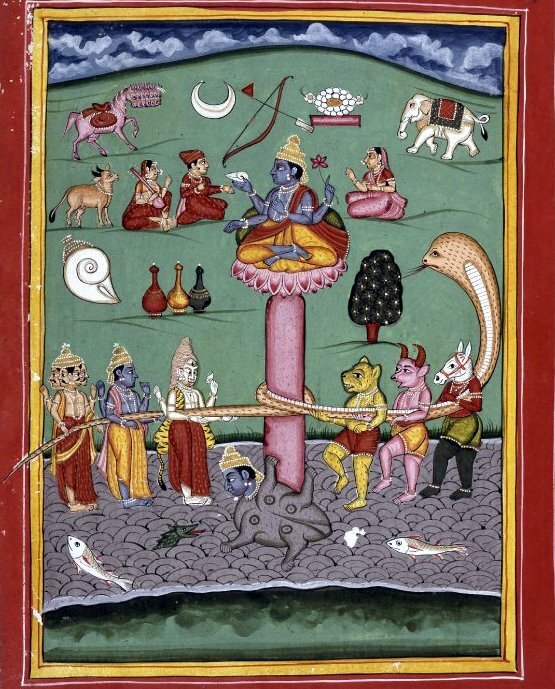 Periyaval was worried that the cows bought in auction would go straight to the butcher. So he told a wealthy devotee to buy all the cows that were auctioned. Later, one by one, he gifted them to devotees who were committed to tending cows with care. That is the kind of love Periyaval had for cows. In the matter of cow protection which as to be ensured by the joint efforts of the people and the government, what the government must do is to make a law prohibiting cow slaughter. It is tireless persuasion on the part of the people that will pave the way for such a law. There should be propaganda and publicity to persuade people of all sects to support the prevention of slaughter instead of stopping it out of fear for a law. Even those who have opposite views should be spoken to with love. It is important to know that the Moghul rulers Akbar and Shajehan and in very recent times Amir of Afghanistan realized the need for cow protection and made laws for that purpose. Therefore, it is my belief that if the issue is properly put forth, people of all sects will extend to us their support. The government also cannot avoid making the law on the plea that such a law cannot be made against the views of some sections of people and the lawful protection will become available. To protect certain things without being destroyed, it is possible only through law. That is why the government enacts laws. Legal protection has been given even for the preservation of wild animals. Sandalwood trees are similarly protected. Similarly, certain other trees which provide food to adivasis have been protected in certain States. Whether it is seen from the practical point of view or from the point of view of Vaidhikam, there is justification for not killing such a noble animal as the cow. The welfare of the cow will ensure the welfare of the country. If it is protected, sins will come down on their own. If it is subjected to cruelties, there will be trouble for the whole world. According to Sasthras, Dharma Devatha is of the form of a bull (Rishabham) with four legs namely, thapas, purity, compassion and sathyam. In Bhagavatham (1.17) it is said ‘Gomatha’ is in association with that bull, that mother cow yields dharma as milk and because the Kali Purusha subjected the pair to cruelty, this age of Kali (Kaliyugam) is in a state of such deterioration’. Therefore, for remedying the Kali dosham and dharma to come up, cow protection is an important measure. Lord Krishna should bestow His grace so that we do not suffer from the blemish of failing in that duty. In Mahabharatham, in the ‘Anusasanika Parva’ in which Bhishma gives Upadesa of several dharmas to Yudhishtira, he speaks about cow protection and explains its greatness. Nahusha Maharaja was once under a compulsion to purchase Syavana Maharishi for a price. He was worried about what price he could give. He thought, ‘even if I give all the three worlds, that would not equal that great rishi’. At that juncture, a rishi who was born of a cow went to him and told him that if a cow was given as price, that would be adequate. The king also accepted the suggestion and said, ‘I have not found any wealth equal to a cow’ – ‘Gobisthulyam na paschyami dhanam kinchith’. 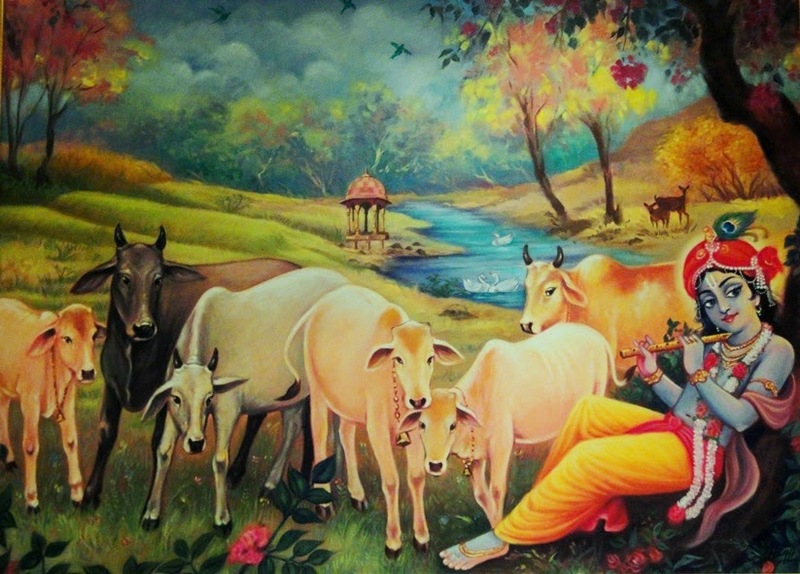 He gave a cow as the price, purchased the rishi and then made him free. There is no great punya that the gift of a cow. It is the greatest remedy for sins. The gift (dhanam) has to be made after making sure that the person who receives it is capable of protecting it. The meaning of the sloka is: “That country where cows have no fear of any cruelty being inflicted on them and live peacefully in gokula, all sins will go and will shine”. Since the performance of yajnas has come down in numbers, there is very little scope for spending ghee on this account. But since god-related activities like puja at home, in temples, in mutts etc are still taking place, we can use ghee for lighting lamps. If we ourselves make cow’s ghee and give it to temples and mutts, it is great punya. 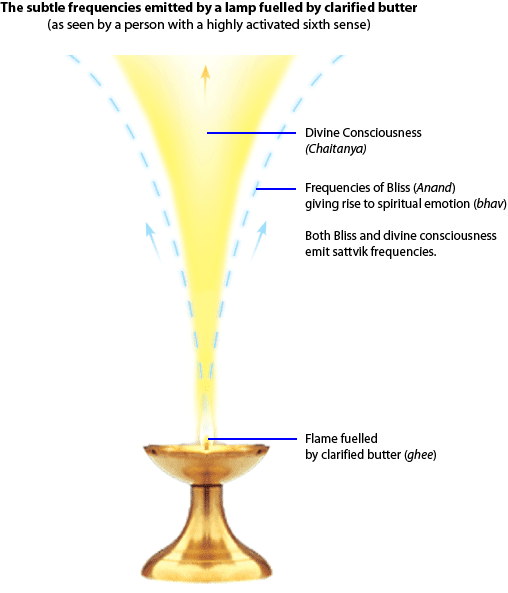 The glow of ghee lamps which is white will induce internal purity also. It is specially good if it is in the sannidhis in temples. It is the duty of devotees to ensure that ghee lamps are lighted in temples at least on Fridays. Whatever Gomatha gives with great compassion must be put to use. Now, either we do not take from her what she gives or use it in improper ways and we are also negligent in protecting her. Gita says ‘Parasparam bhavayanthah’. We and the cow should protect each other mutually. The nourishment we get from the cow is much more than what we give her during the period she gives milk. The dharma of cow protection (go rakshanam) which has taken deep root in our ancient culture should reflect in our action. 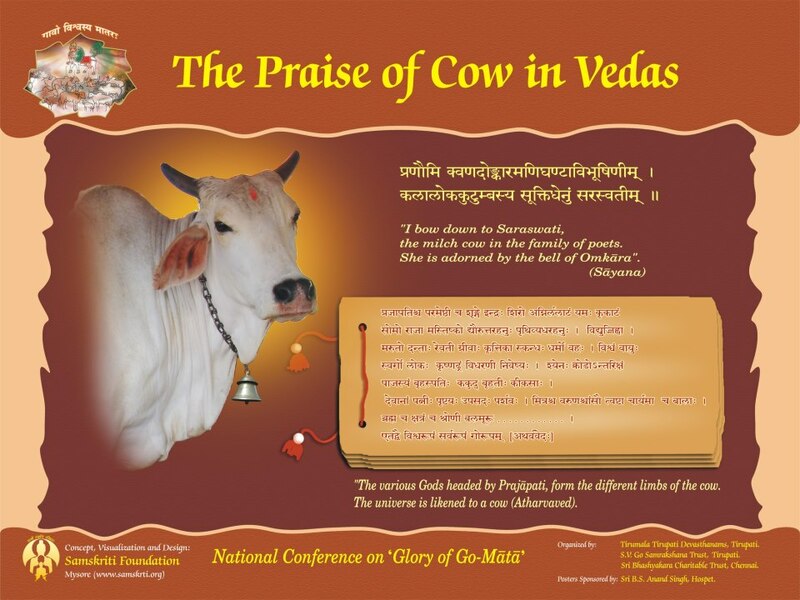 Whatever the cow yields is used yajnas and activities related to worship of god. We take the milk, curd etc and improve our health, but unfortunately what is happening us that most of the milk is being used for coffee. Milk is like amruth, but we mix it with decoction which contains poisonous caffeine. Just as cow protection is necessary, people must pay attention to the protection of the soul also and free themselves from the habit of drinking coffee. 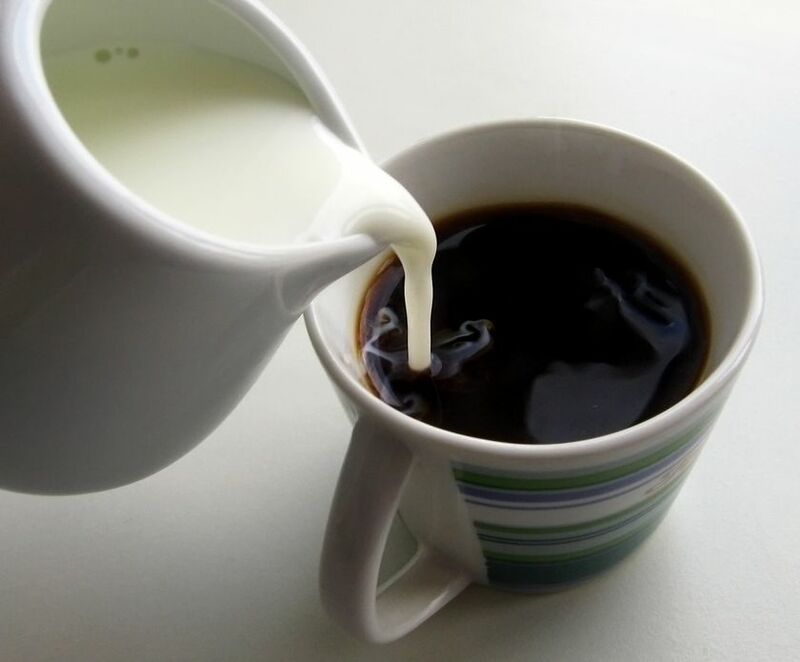 Instead of taking several times, a part of the milk used for coffee should be given to the temples for abhishekam and a part to poor children. When there are lakhs of children who do not know the taste of milk, people drinking coffee several times in a day is a crime against society. Instead of coffee in the morning, we can take ‘kanji’ with butter milk. It is said ‘dhagaram amrutham’. Dhagaram is butter milk. From one measure of milk, we can get three or four times buttermilk and therefore it is economical too. Milk will not suit some constitutions. Gomatha gives buttermilk from milk for such people. People who should not take fatty food can take buttermilk obtained after removing the butter. When speaking about Cow protection we should not fail to express our gratitude to the ‘Nagarathar’ (a sect of rich merchants of Tamilnadu) and people of North India who maintain pinjarapoles for cow protection. In olden days, in order to ensure that the cows had enough to eat, grazing plots were properly maintained. With urbanization, it is all buildings and offices everywhere without garden or fields. It is only now that the government has become aware that this kind of urban development deprives people of even oxygen and is therefore taking interest in ensuring vacant plots for play grounds etc. For the people living in towns, these are said to be their lungs. Along with these ‘lungs’, space should also be provided for grazing plots. The cow should be considered national wealth. Even after it stops yielding milk, it is wealth because it gives dung till it dies. The dung is useful as manure. Nowadays, ‘gobar gas’ is also being produced from dung to be used as fuel. But cow protection is not one which has to be considered in terms of economic viability. 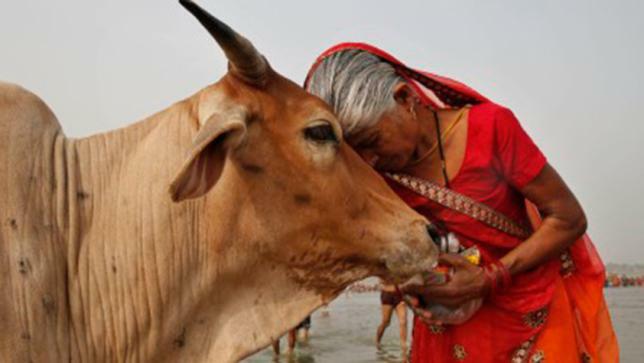 Since the cow has also divine and Vaidhika links, it has to be protected as we protect our mothers. We should put a stop to the practice of considering the cow as useful only as long as it yields milk. Although there is not use talking about it now, we cannot remain without doing so. Before the advent of British rule, in every place, in every village exclusive grazing plots have been allotted for cattle to graze. But the British government which did not know the importance of the welfare of the cows distributed those plots. From that time, the cows started losing their food. Similarly, there were tanks meant exclusively for cattle. These have disappeared now. In the government’s plans of Minor Irrigation Works, such tanks should be included. I shall give evidence to show with how much love people cared for the cattle in the olden times. For beings to get redemption, 32 different kinds of dharma (charity) are mentioned. This is also said to be 64. One of these is to erect vertical stones against which the cattle can rub themselves to get relief from itching sensation. In a country where even such small things are considered as great dharma, we are making the cows skinny and bony and making way for killing them. It is a slur on us. To nurture the cow and protect it is punya which will give all benefits. To neglect it is a great sin which will invite curse and there is proof for this. There is proof for both in the life of Dilipan who was a king of the Solar dynasty. When he went to Devalokam, he returned without going round Kamadenu. For this mistake, he got a curse that he will not have progeny. There is always a remedy for a curse. 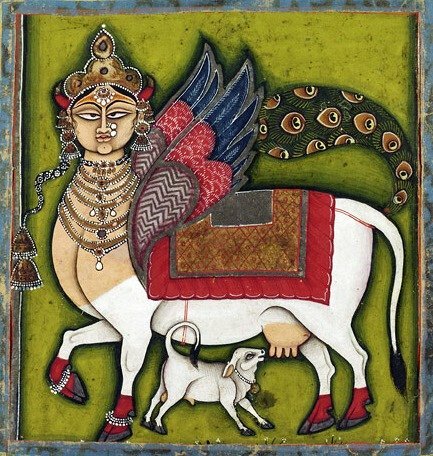 The calf of that Kamadenu, Nandini was with Vasishta, the Kulaguru of the Solar dynasty. On being told by Vasishta, Dilipan took Nandini for grazing, gave it a bath and rendered other forms of service. He did all this along with his wife Sudakshina. The curse was remedied. He got a child who was to become Raghu and the Solar dynasty itself was to take his name as Raghuvamsam. I believe that if awareness is created among our vast population about the need for this service, the requisite finance and the required volunteers will become available. It is enough if a few people get together at different places and start making efforts with perseverance. What should be noted in this is that there should not be a complete dichotomy between those who give money and those who volunteer to do physical service. The one who contributes money should also render some physical service and the one who volunteers to do physical service should also contribute some money. Only then, there will be a total involvement of all people. Apart from this, in the society too, instead of there being two separate groups of people – those who contribute money and those who render physical service – all people will come together as one family and as children of Gomatha. My wish is that in addition to we Hindus coming together as a family in the service of the cow, we have to carry this message with love to people of other religions also, involve them so that the entire society comes together as a family for doing the service. Religious affinity may take different forms for different people but since compassion to animals is common to all, all religionists in our country should come together on this basis. That is my wish. Finally what needs to be done by all people coming together us to ensure that not a single cow goes to the slaughter house and till their natural death they are given food and are sheltered in hygienic sheds. For this purpose, shelters should be specially arranged for the cows which have stopped yielding milk. If individuals are not willing to keep them anymore and want to dispatch them to slaughter houses, they should be purchased from them and kept in such shelters. Several owners of cows may be really poor and will be living a hard life. They cannot be expected to give them away free. But just because money has to be paid for such cows, not a single cow should be allowed to go to the slaughter house. It may be thought; “To purchase such cows from the owners will mean a lot of money. Apart from that it will be a demanding task to take care of the old cows’. But when we feel the importance of this service, money and labour do not count for much. It is not necessary that all of us should do some great sacrifice or make great efforts to feed the cows well and ensure that they do not starve. It is true that any amount of sacrifice or effort on our part for the sake of the cow is deserving. If some or even many people set out to do it, it is to be appreciated. But if attention is paid to a small matter by all people, several cows will get a good feed. If we make arrangements to give as feed to the cows all the vegetable waste we generate in our homes daily, a number of cows will get fed. We cut vegetables daily at home. In hotels and hostels, this is done on a large scale. Instead of throwing away the vegetable waste, it should be collected in a special covered container. There should be volunteers who will collect them from door to door. This idea should not be dismissed thinking that nothing much will become available by this way. Considering the amount of waste that gets generated daily in every home and more particularly in hotels and hostels, each day’s collection will be very substantial. We need not be concerned with the cows that are cared for well in rich homes and in farms. Our aim is to protect those cows which starve and are in danger of being dispatched to the slaughter house. If this task is undertaken and carried out with care, we can see for ourselves that a large number of cows can be fed. We can also be the recipients of the grace of Lord Krishna. Like the peeled off skins of vegetables, the water that is obtained when filtering cooked rice can also be given to the cows. But in most homes, rice is being cooked in cookers. Where rice is still being cooked in the conventional manner, this service can be rendered. Even the water with which rice is washed before being kept for cooking becomes food for the cow. Wherever possible, a small plot can be allotted in the backyard of houses to grow greens that cows specially like. We should think that we are offering food to Bhagawan Vasudeva and protect the cows by any of these means. Once we develop that feeling, we will not feel the strain in doing anything to help the cow. By what is said above it should not be concluded that a legal ban on cow slaughter is now required. A law banning cow slaughter has to be passed as soon as possible but instead of the matter ending with that, there is the duty of the people. 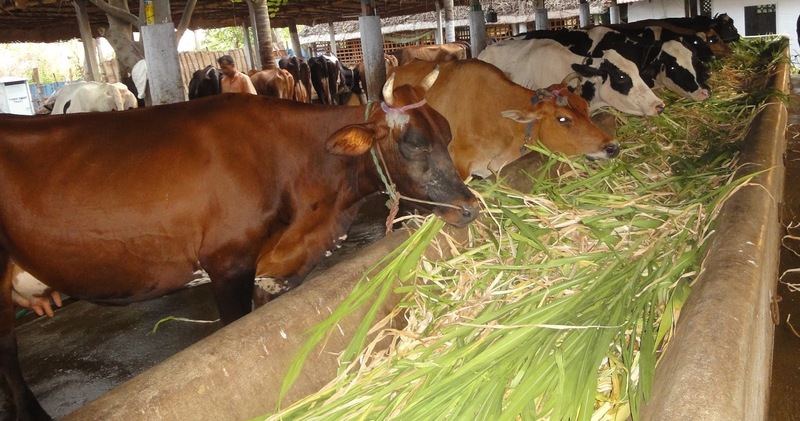 It is to feed the cow well and provide for them sheds which are hygienic. 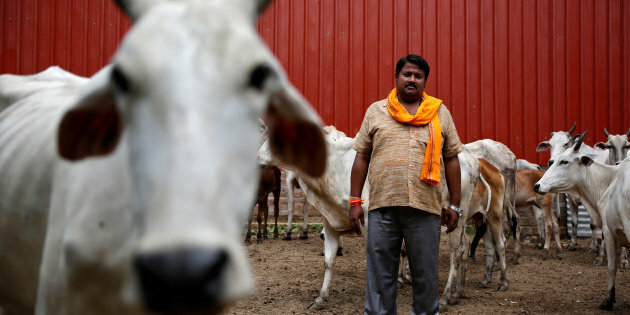 For a long time now, many people have been pressing for a law to ban cow slaughter and have been even agitating for it. But they have not taken any specials steps to ensure what needs to be done by the people to protect the cow. In this matter, I myself have not done my duty well. It is only to point out our duty, I have said that what the other side says is not without justification. One the whole, a law passed by the government is necessary. I want to emphasize that to the same extent, people should treat the cows well till they die a natural death. On the one hand, we are religionists who worship the cow as a deity. On the other hand, we are making available for slaughter cows which have stopped yielding milk or we starve them. This hypocrisy is a great blemish on us. 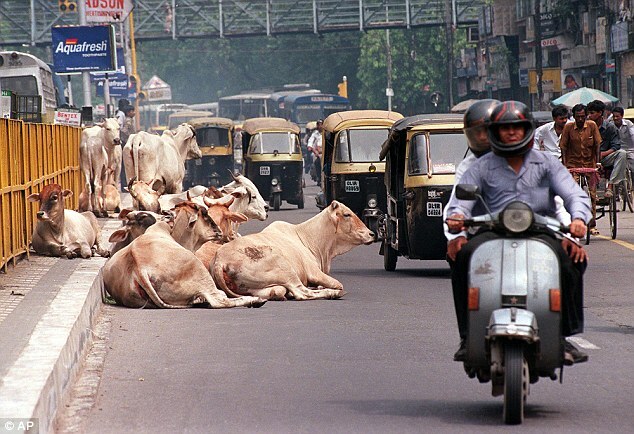 Till such time we do not protect the cows well until its natural death, we are unfit to call ourselves Hindus. Whether during the period the cow yields milk or when it stops yielding milk, if we do not give sufficient food to the cow, it is a great blemish on us. All of us are criminals in this respect. Our negligence here is unpardonable. If we keep side by side our cow and the cow of other countries where it is not being given a status of divinity, we will feel ashamed. People of other countries, though they do not treat the cow as divine and though they may be eating its meat, they feed it well and keep it healthy. But we give it minimum food just to get milk from it. We cannot escape by saying that in other countries, the cows are fattened just for that meat. Whatever may be the reason so long as the cow is alive, they feed it well. Without taking measures to feed the cow well and protect it, there is no use of our shouting that cow slaughter should be prevented by law. Those who support cow slaughter point to the lean and emaciated cows that we keep and say that instead of keeping them like this, it is better to kill them as a relief to them. We are unable to counter this argument. 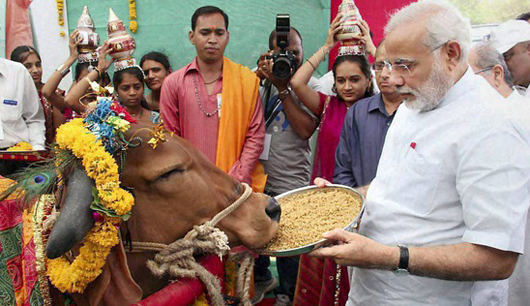 Only some people can do puja to the cow treating it as divine. But there is a duty that is to be performed by everyone – giving fodder to the cow. Every day we have to give atleast a handful of grass to the cow. Sasthras refer to this as ‘gograsam’. ‘Grasam’ means a mouthful of food. It is from ‘gograsam’ that the English word ‘grass’ has been derived. In his Thirumandhiram, Thirumular has mentioned the duty of giving ‘gograsam’ in between the duty of offering a leaf (bilva) to Iswara and giving alms. If it is said that the cow is the embodiment of all the devathas, it is not possible for our little mind to comprehend it. We only wonder at it and it is a wonder tinged with fear. That is why Gomatha is particularly referred to as one devatha namely, Lakshmi. In Amarakosam where the several names are given for Lakshmi, the names Lokamatha and Lokajanani occur. Gomatha is the Lokamatha. On the one side Gomatha is called Lakshmi. On the other, she is said to be one of the abodes of Lakshmi. Lakshmi’s abodes are five: The simantha (central parting of the hair on the head) of a sumangali, the interior of a fully blossomed lotus flower, the forehead of the elephant, the rear part of the bilva leaf and the hind part of the cow. We have already seen that opposites come together in a cow. Similarly Lakshmi does not reside in the face of the cow, but in the rear part. While we may decorate the cow by applying sandal paste, kumkum etc on the face and putting garland around its neck, when it comes to worship we have to decorate the hind part and do archana. There is nothing lowly about the cow. Everything about it is great. From the fact that in the dharma pitas like our Mutt early in the morning ‘Gopuja’ is done, the high status enjoyed by the cow can be understood. Although the elephant is much bigger than the cow, the puja for the elephant (Gajapuja) is done only after the Gopuja. 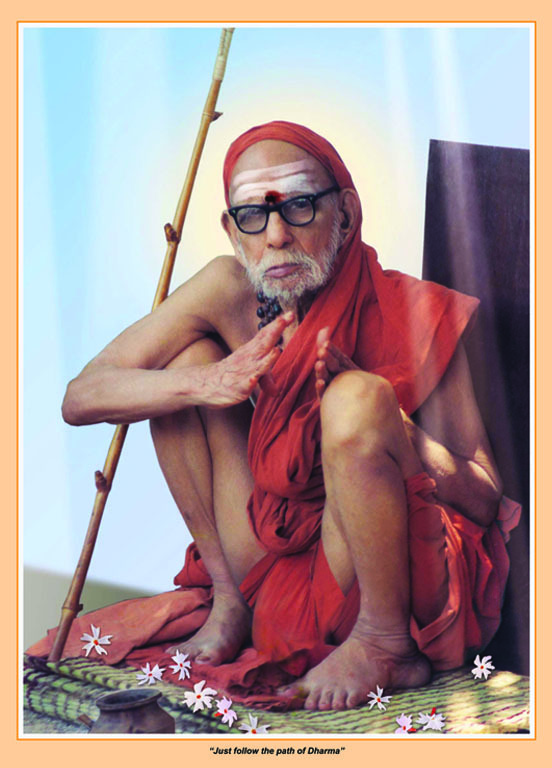 Vedhas are the back bone for the welfare of the world. Yajna is the backbone of the Vedhas. The kartha who performs the yajna and the cow which yields the important materials for the yajna are the backbone of the yajna. Therefore it means that the cow is there for the welfare of the world. That is why it is said ‘Go rakshanam is Bhurakshanam’. It is for this reason that when prayer is offered for the welfare of the world, the cow and the kartha (who performs yajna) are first mentioned separately and then prayer is said for the welfare of the world. 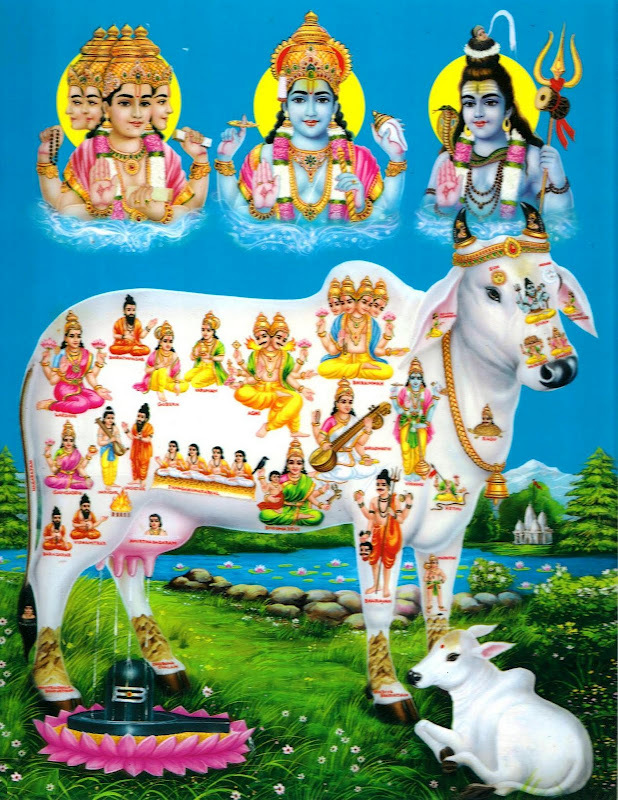 The reason why the cow and the Brahmin have been mentioned separately when there are so many animals and there are so many jathis is that the two are most useful in yajnas which are performed for the welfare of the world. This was not said out of any feeling of partiality. These lines are from the first of the ‘Mangala slokas’ recited at the conclusion of Ramayana Parayanam. Since the sloka comes at the end of the recitation of Ramayana which is the story of Ramachandramurthi who ruled his kingdom in accordance with Vedhas, performing Asvamedha yajna etc, first it is said that the king should rule justly and then the welfare of the cow, the Brahmin and the world has been mentioned. Rama and Krishna are the two eyes of this country. When praying to Krishna Paramathma for the welfare of the world, before mentioning the good of the world, the welfare of the cow and Brahmin are mentioned. Although the two are the pillars of yajnas, the cow has been given the first place and then the Brahmin – ‘go brahmana’. The Brahmins are called ‘Bhudevas’, they are the devas who are not in devaloka but are in bhuloka. Those Brahmins who have dedicated themselves to the Vedhas and are doing yajnas and other anushtanas for the welfare of the world are referred to like this, not the present day Brahmins who have given up the swadharma. The cow is mentioned before such true Brahmins who are bhudevas. It is said of someone that he not only spoiled himself but spoiled the holy temple tank. Similarly since the Brahmin has given up the swadharma of Vedha rakshanam and therefore yajnas and homas have declined, the virtuous function of the cow (of giving its ghee, dung etc) has been affected. 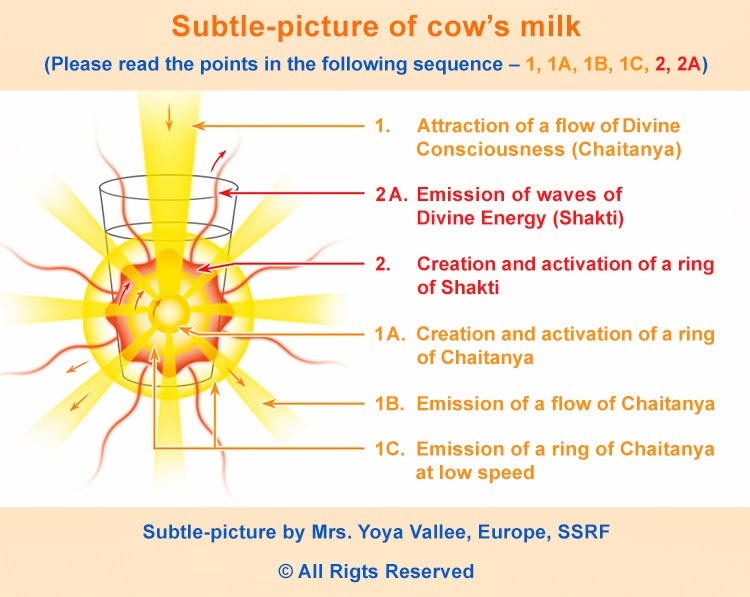 The cow which protects the yajnas by giving the important materials needed for the same has the power to protect the efficacy of the manthras by its mere presence. That is why it is said that doing japa inside a cow shed yields crores of times the benefit that normally accrues. There is no place as pure as a ‘koshtam’, the cattle shed. All the holy waters are within it. In our temples there are sannidhis for different deities and there is a holy tank. 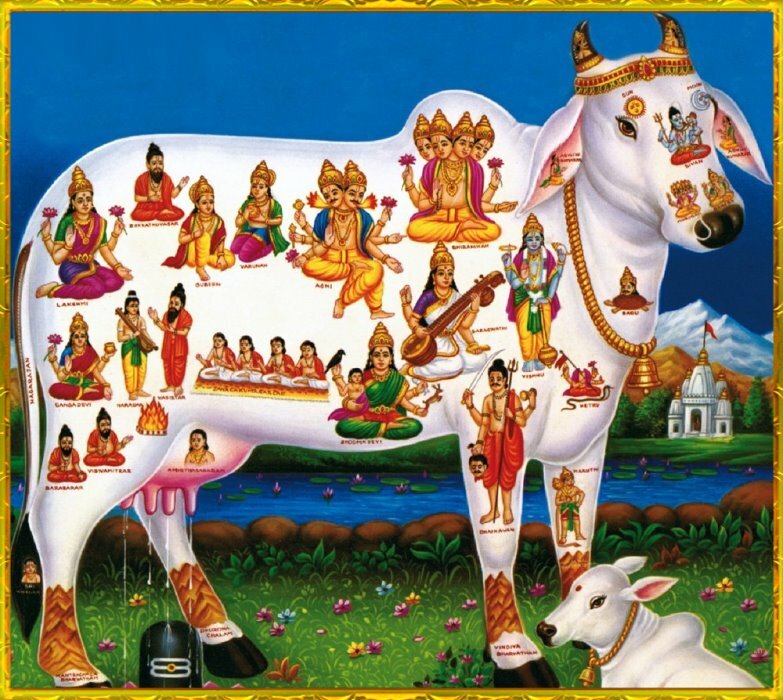 But the cow is the temple in which all the deities and all the holy waters are there. Abhishekam is part of devotional worship. Agamas and puranas are the authority for the same. More than all that, the basic authority for our religion are the Vedhas. Without the support of the Vedhas, agamas and puranas cannot have a status of being the authority. If it is thought that Vedhas are meant only for our country, there cannot be a greater mistake. Vedhas are recited only in our country and only if Vedha karmas are performed here in Bharath (which is karmabhumi), they are fruitful. But the fruit is not only for this country. We do Vaidhika karmas here keeping in mind the good of the entire world. Just as the blood flows from the heart to all parts of the body, the Vaidhika anushtanas we observe here bestow welfare on the whole world. In other words, the world will be there only if the Vedhas are there. The welfare of the world depends on the yajnas and other Vaidhika karmas done here. There need be no doubt about it. Yajnas give life to the whole world. Two things are very necessary for the same. One is the person who performs the yajnam (yajamanan) and the other is the cow that gives the important materials to be used in the yajna. 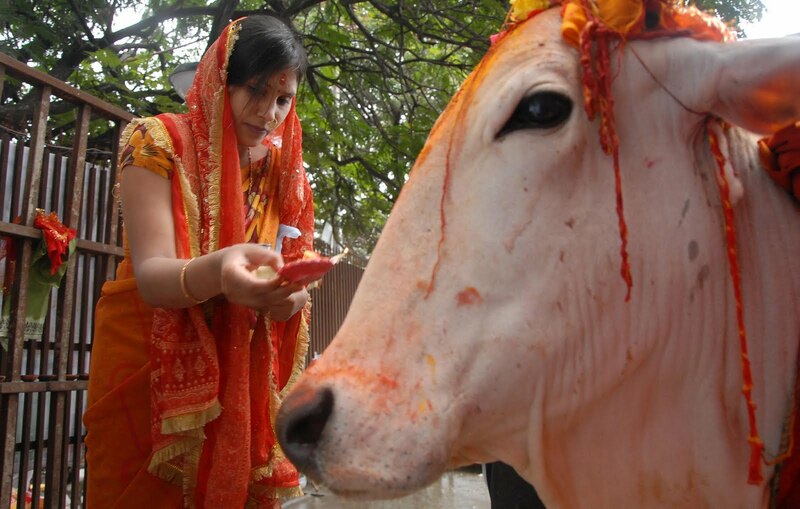 The important ‘ahuthi’ offered in yajna is the cow’s ghee. All the things that are offered in yajnam have the common name ‘havis’. But ‘havis’ particularly means the cow’s ghee. Even the other things are offered only after cleaning them with ghee. In agnihothram and other yajnas, cow’s milk is offered in the homam. Curd is also used in the homa. If ghee, milk and curd become homa themselves in the fire, it is the cow dung cake that keeps the fire glowing. Therefore, if there is no cow, there will be no yajna. Just as the cow dung is sacred, the dust rising from its hoof is also sacred. Usually, dust from the feet is considered something lowly. But we accept the same with bhakthi from divine personages. The dust from the cow’s feet is also sacred. When the cows return as a herd after grazing they raise a cloud of dust. If we stand at a place where such dust falls on our body, it is said to be a bath which is holier than a bath in holy water. Normally, we take bath to remove the dirt on our body. But here, dust itself becomes holy bath! Young Krishna had immersed himself in such dust.